Description of Einstein's Theory of Relativity and GPS - Why is Einstein's Theories of Special and General Relativity so Important to GPS Systems? Description of Einstein’s Theory of Relativity and GPS – Why is Einstein’s Theories of Special and General Relativity so Important to GPS Systems? Almost everyone who has used a cell phone, mp3 player, watched television or surfed the Internet has heard of Albert Einstein and his theory of relativity. A somewhat smaller percentage may know that the “theory of relativity" actually exits in two parts: the Special Theory of Relativity and the General Theory of relativity. Probably a much smaller percentage of that group may know that with out the application of Einstein’s two theories, the GPS units in our cars, phones and anything else that might move would not work very well. In fact, they would be down right useless! There are two key elements, one in each theory that come into play to make the GPS work. In Einstein’s Special Theory of Relativity he united space and time into one entity—space-time. Within this new continuum, time slows down as you move faster. Many have probably heard of the twin paradox, where a pair of twins is separated; one stays on Earth and the other travels on a trip to a nearby star at near the speed of light. When the traveling twin returns home he finds his Earth-bound twin much older than he is. The space trekking twin’s biological clock slowed down as the speed of his spaceship approached the speed of light. This characteristic of time has been proven by comparing two atomic clocks: one stationary on the earth while the other was flown around the world aboard a jet plane. The clock that went for the ride was slower than the clock that stayed behind. Very interesting, you might say, but what does this have to do with my GPS? The GPS satellites are in orbit above Earth at an altitude of 26,600 km (15,960 miles) and to stay in that orbit they are moving at a speed of 14,000 km/hr (8,424 mph) relative to the surface of our planet. 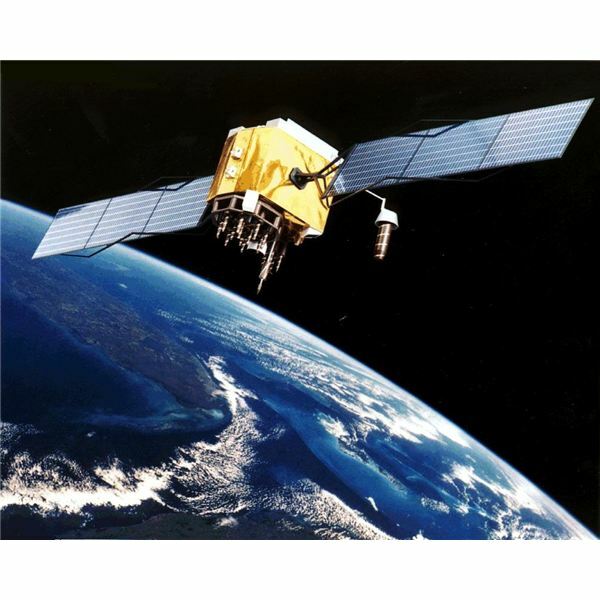 This speed, although not any where near the speed of light (299,793 km/s or 186,282 mile/s) is still faster than any reference spot on the earth is moving, therefore a clock aboard a GPS satellite will run correspondingly slower – about 7200 ns/day (7200×10-9seconds/day) – than a clock on Earth. This is a very small number indeed, but very measurable and that difference needs to be accounted for. Now for the General Theory of Relativity. In this theory, gravity comes into play and it too affects time. To be brief: a clock in a gravitation field will run slower than a clock in a weaker gravitational field. Again, looking at the GPS satellite orbiting above us, we should immediately realize that the satellite is in a lower gravitational field than we experience on the surface of the earth. Acceleration due to gravity falls off as: 1/(radius)2. It is not zero, as some people might believe it would be in space, but at this altitude is about 4% of the acceleration we feel here on Earth, known as “1-g", or 9.8m/sec2 (32 ft/sec2)—small, but not zero. This corresponds to an increase in the clock of about 45,900 ns/day; a much bigger affect than that provided by the satellite’s speed. The changes in time due to these properties of relativity total to an increase of about 38,700 ns/day and will conspire to make your GPS receiver build up errors in location that could cause it to be off on the order of kilometers after several hours—up to 10 km (6 miles) per day! 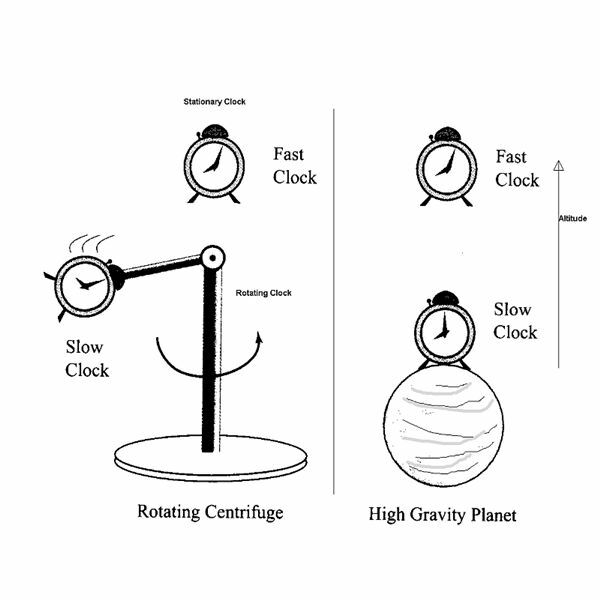 The system is designed to correct for these errors by setting the atomic clocks on board the satellites to run slower than their corresponding reference on Earth before launch, so that once in orbit, and the effects of relativity take hold, the satellite’s clocks speed up and very closely match the reference on Earth. There are also corrections that are made to the satellite’s clocks to adjust for abnormalities in the satellite’s orbit that will cause their speed or altitude to drift over time. Thanks to the amazing insight of a patent clerk almost a century ago, today you can drive from New York City to Los Angles and trust that your GPS receiver will guide you unerringly to your destination. *Hawley, John F. and Katherine A. Holcomb, Foundations of Modern Cosmology, Great Britain, OXFORD University Press, 2005, pg 222.